The race was dominated by Rabobank from start to finish and Marianne Vos duly won. Our team was the main competitor, together with Lotto and United Health Care. Elisa ended on a fine 5th place in the GC, and also had a superb 2d place on the difficult stage 2. 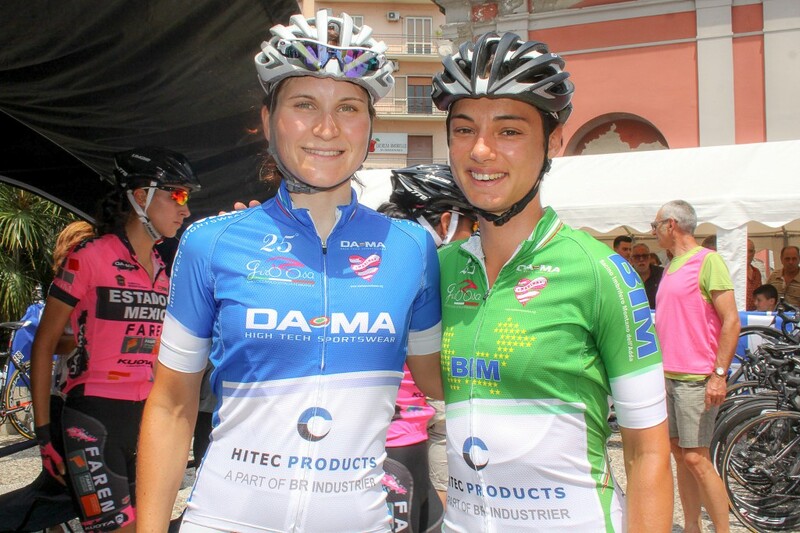 Ashleigh was in the climber jersey, while Elisa also won the best Italian jersey. Miriam fought well on against the overwhelming big European teams and under the circumstances a 13th place is a good performance, although she was dissapointed. Stultiens of Nederland won the race from a break. In Denmark Julie road a perfect race but missed a gear in the final sprint. She had to settle for third. In France Audrey missed the break and had to settle for the peloton sprint 9th. The Italians decided to remove some climbs because of the weather – Elisa was 6th. In Norway we basically failed to pull back a early breakaway, Reacted to slow and Cecilie was 25 seconds too late to defend her jersey. In Sweden Sara was 12th after a frustrating race. Like the Tour de France, the Giro d’Italia Internazionale Femminile, also known as the Giro Rosa is the marquee race of the cycling season. Held from July 4-13, while the men tackle the climbs of the Pyrenees the women will tackle the unforgiving climbs of northern Italy. Raced over ten stages – a prologue individual time trial and nine road stages – and 953km the race, now in it’s 25th edition, starts in the southern Italian town of Caserta before finishing on a climb made famous by the Giro di Lombardia, Madonna del Ghisallo more than a week later. Hitec Products Sports Director, Marc Bracke believes this edition of the Giro Rosa is one of the hardest in years. “I looked at the parcours and it’s a difficult Giro Rosa this year, there are a variety of stages like flat and mountain stages but importantly there are three mountain top finishes,” Bracke said. The eight Hitec Products riders headed to Caserta for the opening prologue are: Elisa Longo Borghini, Ashleigh Moolman, Audrey Cordon, Chloe Hosking, Lauren Kitchen, Julie Leth, Emilie Moberg and Cecile Gotaas Johnsen. “I’ve selected a team of riders that I think can win on a variety of terrain,” Bracke said. “We have riders who can win a stage like Chloe (Hosking), Audrey (Cordon) and Ashleigh (Moolman) and we have our strong Italian Elisa Longo Borghini who can really challenge for the general classification, and in her home country,” he said. The biggest small team in the world of women’s cycling will be in action tomorrow evening, beginning the ten day stage race with a 2km prologue which starts at 8.30pm CET.